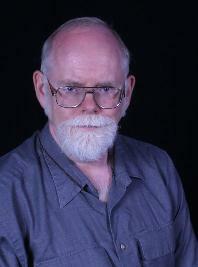 KidsEBookBestsellers.com: The Star Carrier Series Carried Bill Keith to Three Books in the Top Ten! 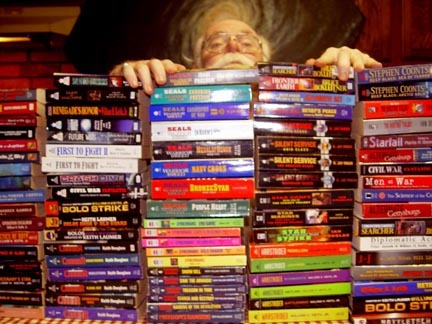 The Star Carrier Series Carried Bill Keith to Three Books in the Top Ten! Today we get to hear from Bill Keith. Last week his books Singularity, Center of Gravity and Deep Space hit the number 3, 6 and 8 spots in the Children's and Young Adult section of the EBooks.com store. And they're still there this week! This Star Carrier series is written under the pseudonym "Ian Douglas". So far, Bill has seventy-eight novels, ten non-fiction books, and twenty short stories published under a variety of pen names. He says there are more on the way, ranging from science fiction to action-adventure to military technothrillers. When he's not writing, he has designed forty games and game modules, and he's an artist. What a delight to hear from such a talented guy! First, let's hear what your books are about. The Star Carrier series, which so far includes the titles Earth Strike, Center of Gravity, Singularity, and Deep Space, examines our relationship with our technology against the backdrop of an ongoing war against a more advanced alien galactic civilization. Special attention is given to a concept called the Technological Singularity--a point in the relatively near future when our rapidly escalating technology--and our connections with it--will accelerate so swiftly that the very definition of what it means to be "human" will change completely, passing utterly beyond our current comprehension. One of the main characters, Trevor Gray, comes from a culture with little in the way of electronic technology, and through his eyes we learn about technology and the Singularity, about the nature of intelligence, and ultimately about our place in the evolution of the universe. At least two more Star Carrier novels are currently in the works after these first four. I actually started out in 1979 as an illustrator for various science fiction role-playing games, including Traveler and BattleTech. 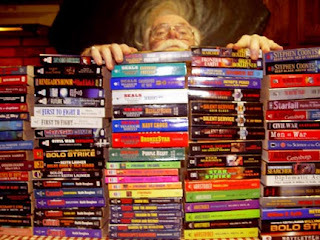 While working as a freelancer for game companies such as the old GDW and FASA, I had the opportunity to begin writing, first, game scenarios and supplements, and, later, full-length novels, including the very first three BattleTech novels published by FASA. Well... I write about what I like and what interests me, and hope that the passion shows through in the writing. The stories tend to be fast-paced... but I've had a lot of feedback from fans who tell me they really like how I use and explain the science, which I try to keep both accurate and unobtrusive. I even had a fan letter last week from a real-world astrophysicist, who can't read most modern SF because of the bad science... but he enjoyed Star Carrier! I don't use social media, and leave the marketing to the publishers. I tend to let my work speak for itself... a strategy that must be working, since Center of Gravity hit the New York Times Best Seller list last year, something almost unheard of for a military SF novel! My target audience is everyone who is interested in science and technology, in our relationship to our quickly changing technology, and in Humankind's future as we become a mature species expanding out into the universe. Age doesn't matter; the first SF-military adventure novel I ever read blew me away when I was 10, and now, at 63, I still can't get enough of it. I was initially skeptical. The e-format, I felt, would never replace the printed page, and people would always prefer the look and feel of a print-on-paper book. I had no problem with e-publishing, as such; I simply felt it would be little more than a toy for a long time to come. I did not choose to enter the world of e-publishing; that was done by my publisher. My royalties--the payment I get for each book sold--have increased tremendously, however, thanks to my e-book sales, and I've received many, many fan letters from people wondering when various titles would appear in electronic form. I now believe that the electronic format--or something closely related--will replace paper at some point... though probably not until we hit the Technological Singularity, maybe in a century or so. Until then, I, at least, will prefer traditional books. I write all of my books for print format. When I started off writing novels, in the early 1980s, there was no electronic media, and print books were the only game in town. The publisher, by contractual agreement, releases them now in electronic format if and when they feel the need later. Doing so was their marketing decision... and, judging from the sales, quite a good one. As stated above, I do believe e-publishing may eventually replace printed media entirely, but I don't see that happening for many decades yet. The one factor that might accelerate this process would be the financial failure, on a large scale, of print-media companies and bookstores--such as the late, lamented Borders, under pressure from corporate giants like Amazon. If enough such companies go under in the current economy, it might turn out that such businesses simply become economically nonviable. On the other hand, new technologies such as print-on-demand may extend the life of traditional books. I hope so. My house is filled with paper books... and they never need batteries or an Internet connection. Within the next five years, I expect to see pretty much more of the same... with more and newer technologies bringing a wider variety of books and stories to kids, but no major changes to the market as a whole. Explore Bill's website to learn more about him and his his books. And check the updated Kids' EBook Best seller List for more fascinating authors and their latest work in e-format! Want to keep up with all the interviews? Follow me on Facebook or on Twitter.